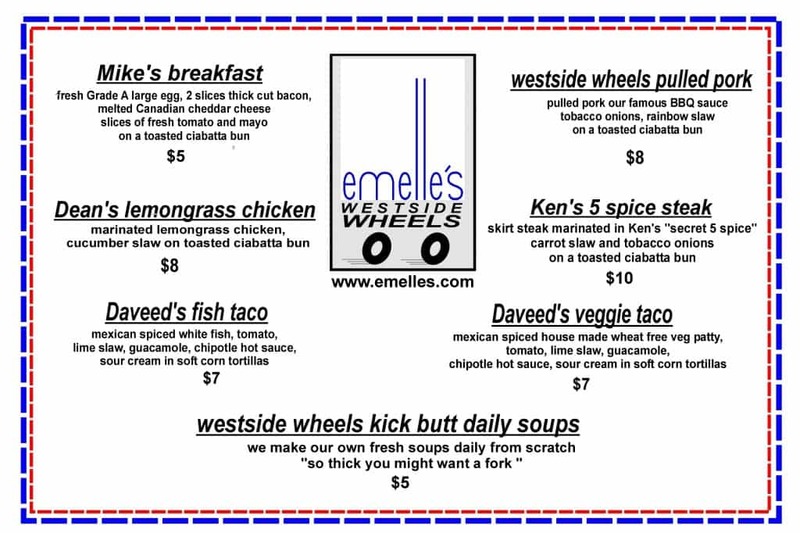 Category Archives for "New News"
0	Emelle’s Westside Wheels…Taking our signature cuisine to the streets and beyond! Located in the heart of downtown at the corner of Granville St. & Dunsmuir, our new bright red food truck is hard to miss! It’s only been a few short weeks since we introduced the new member of the Emelle’s family to Vancouver and it has been a blast so far. A selection of some of our favorite hot sandwiches, tacos & house made soups traditionally featured at our Westside Kitchen, including our classic breakfast sandwich now served on a fresh ciabatta bun, along with tender pulled pork with our signature bbq sauce and our new favourite lemongrass chicken with cucumber slaw. Gluten-free options are also available with our fish & vegetarian tacos made with corn tortillas and gluten-free bread options available upon request. 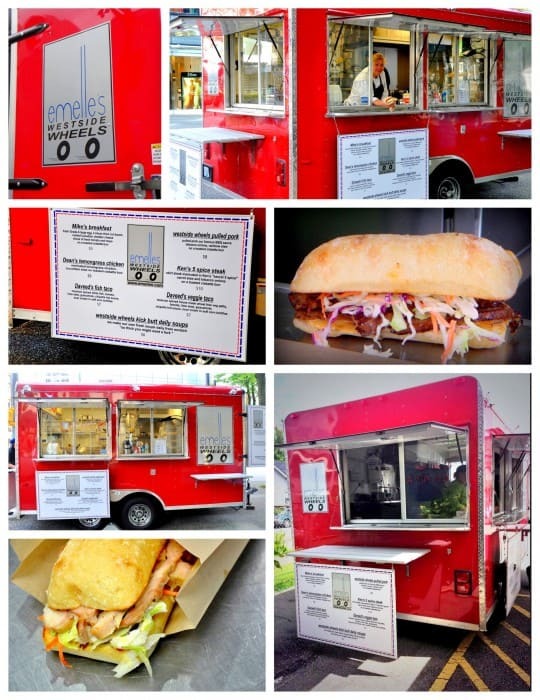 Besides the unavoidable food truck craze that has taken over not only Vancouver, but Canada and the States, the food truck opens up a whole new window of catering opportunities for Emelle’s. Since the opening of Emelle’s in 1999, some of our favourite events to cater have been festivals. Festivals allow us the opportunity to get outside in the community, enjoy the arts and culture of Vancouver, meet a lot of new and interesting people and serve some great food! But the biggest challenge we’ve met with catering festivals was the amount of equipment that was needed to be brought in, set-up and torn down. Tents, generators, ovens, fridges, tables, bbq’s and more! 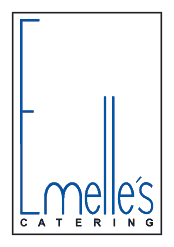 Emelle’s would be the first on site to set-up and the last to load out. The long days made it difficult to do no more than one or two festivals a year. Enter our Westside Wheels: a mobile kitchen! Stocked with a grill, deep fryer, fridge and more! The set-up and take down is now a fraction of the time we used to spend, which allows us to participate in more festivals on multiple weekends throughout the year. Also, having a kitchen on wheels also allows us to easily bring in additional equipment to locations and venues that have limited kitchen facilities. Want a food truck for you next event? Look no further than Emelle’s Westside Wheels! Easily transportable, we can park our truck just about anywhere: outside your office, venue or house; in a field or park. And we can serve more than just sandwiches! If you want to serve guests poutine as a late night snack at your wedding, we can do it! If you want to serve tacos at your company picnic, we can do it! Crepes, waffles, pancakes, hot dogs, you name it! 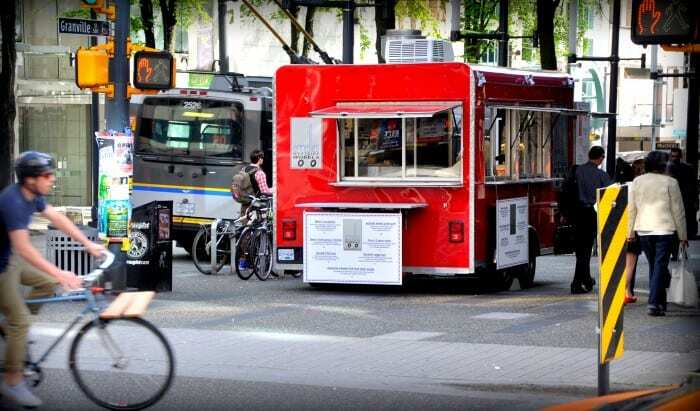 What sets Emelle’s Westside Wheels apart from all of the other food trucks in Vancouver, is that it’s owned and operated by a catering company. Just like any of our events, we can customize and create a menu that fits within the theme and budget of your event, cooked and served from the window of a food truck! Where can you find Emelle’s Westside Wheels?